Google Glass rumors from years have now comes to a reality after Google officially announced Google Glass Technical Specifications, Features, Availability, Google API Docs for Apps Developers and Google MyGlass Companion App for Android. 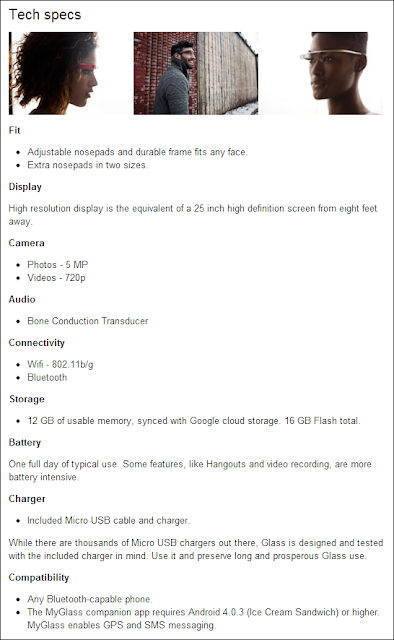 According to the official report; Google Glass Specs and Features contains 25-inch high definition display-screen with 640 x 360 size, 5 mega-pixel digital camera with 720p HD videos recording, 16 GB flash HD storage with ability to synced with Google cloud storage service with the capacity of 12 GB of useable memory. The battery of Google Glass will be last upto "one whole day with typical usage", Google Glass also supports connectivity of 802.11 b/g Wi-Fi and Bluetooth interface with the ability to work with any Bluetooth capable device. Let's check-out the Full Technical, Hardware, Software Specifications, Features & Availability of Google Glass, Google API Documentation for Developers and Google MyGlass Companion App for Android below. Following are the official details available for Google Glass Technical, Hardware, Software Specifications and Features. Google has also officially releases MyGlass Companion Application for Android smartphone and tablet devices which is available on Google Play Store. Android smartphone and tablet device users can Download and Install Google MyGlass Companion Application on their devices running Android 4.0.3 Ice Cream Sandwich+ mobile operating system or above/higher. Google MyGlass Companion App allows users to manage and configure Glass frames right from Android device and also enable GPS and SMS messaging. Google MyGlass Companion App for Apple iOS devices i.e. iPhone, iPad & iPod Touch will also be available soon after the official release of Google Glass retail stock. Google also has a web-based setup page for users who are facing any kind of problem and troubleshooting with Google Glass. Google has also announced the Google Glass API Documentation and Guidelines for Developers who are interested in Google Glassware Development. Google says that working on Glassware involves “challenging design problems” and it encourages developers to avoid surprising users with unexpected functionality because with anything new it provides both exciting opportunities and challenging design problems for developers. 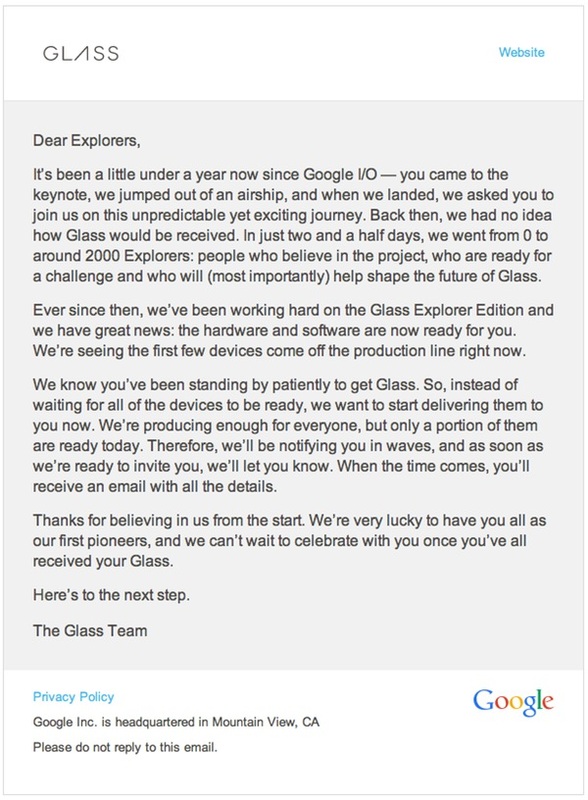 Those Glass Explorer Program members who had participated and Pre-Ordered Google Glass at Google I/O last year has been officially notified via Google through e-mail that the production of first batch of Google Glass has been completed and they will be shipping it out in the next few weeks and delivered to all those lucky members. Some Google I/O pre-orderers and members got the following e-mail from Google regarding Google Glass Availability and Shipment.